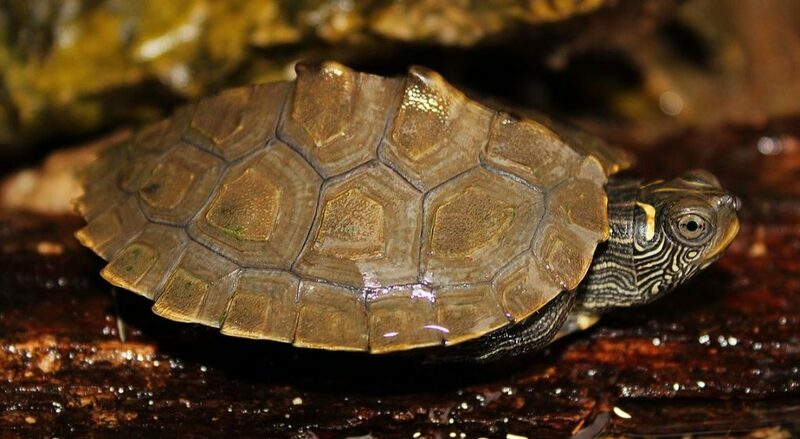 Also referred to as Sawback turtles, the false map turtle is one of the many species of the Map turtles. False map turtles are typically docile and don’t bite. They belong to the Emydidae family of map turtles. They are usually considered native to the rivers of Mississippi and Missouri. They are also found in Wisconsin. They are large in size, but the females are larger by a few inches than the males. They have massive heads and strong jaws. They can live up to 20 years while well-kept turtles can live as long as 30 years. A False Map Turtle carapace can vary from brown to olive in color. It additionally showcases lightweight yellow markings that have dark borders. The plastron, on the opposite hand, can be a yellow color or a cream color. In juveniles, the plastron has dark lines that dash down along the seams and form a pattern. You will see a backward “L” form behind the eyes. They are considered non-aggressive. Generally, they don’t bite and can be kept with other turtles. They are creatures of flowing water and need an aquatic environment with good filtration. Females get comparatively big which makes things a bit more challenging because they will need a bigger tank. These turtles are adept swimmers, but don’t forget to put logs or other things in the environment so they can rest and bask. Basking helps them to rest and dry off ensuring they don’t have any shell issues. Map turtles, in general, seem to be more sensitive to those problems than other turtle species, like painted turtles and sliders. For the basking area, it should be heated to a minimum of eighty degrees and lit with multi-spectrum lighting. They are omnivores by nature. They feed on aquatic insects and vegetations. Crayfish, crustaceans, fish, dead fish and snails are some of the aquatic life included in their diet while floating aquatic plants are consumed by them. Since these are extremely aquatic, they eat only when under water. The breeding season begins in spring and lasts till fall. Eggs laid are buried in burrows dug in sandy soils. Similar to other reptiles, the temperature during the incubation process is determined by the gender of the baby turtles. Females would lay 12 to 22 eggs which are laid in 3 clutches every year. Most hatchlings become prey to grackles, ring-billed gulls, great blue heron, catfish, and red-winged blackbirds. Foxes, otters, and raccoons are common predators of the eggs. Younger false map turtles are usually eaten by rice rats. Their defense is to get as far away from the enemy as possible. Their patterned and colored bodies help them camouflage into their surroundings to avoid confrontation. These turtles are best kept in large tanks as a pet. They are highly aquatic and good at swimming, so the water level is usually kept quite high. They enjoy filtered water and require flat surfaces in their tanks as they like to bask. 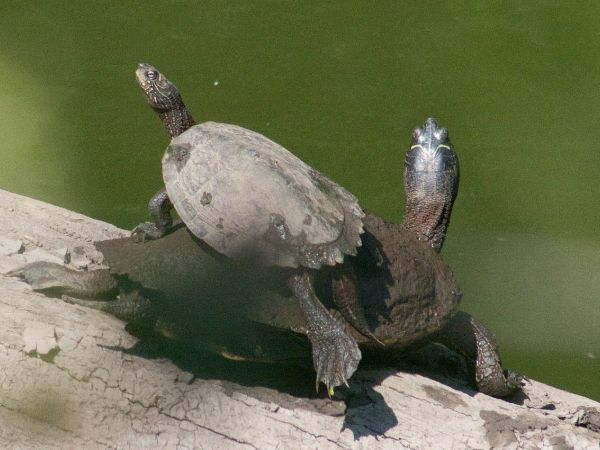 The temperature of the turtle can be maintained by basking or swimming. A high-quality UVB light should be kept on at all times so they may bask. If you need help choosing a one, check out our best uvb light review. Put your lights on a timer in order to simulate night time. Aquatic plants can be added to maintain high levels of oxygen in the water. This species is considered endangered in the Dakota range. Since it’s been included on the South Dakota Natural Heritage Program, if found, it should be reported to the South Dakota Game, Fish and Parks. So, what do you think? 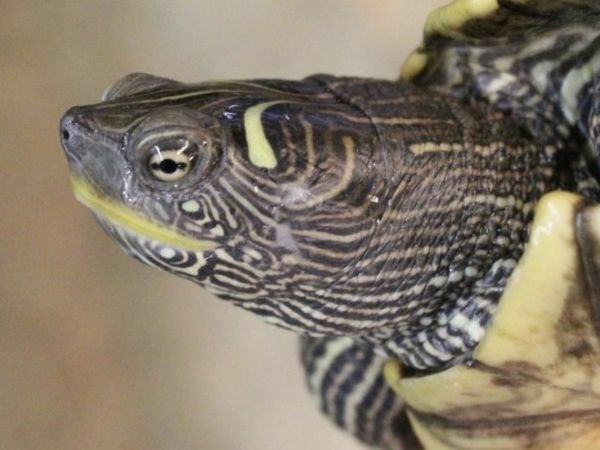 Are you going to get a false map turtle? Do you already have one? Or maybe you have a different type like a Mississippi Map or Ouachita. Let me know in the comments below!